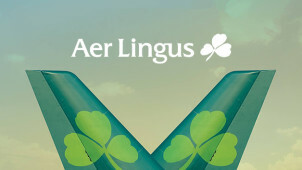 20% Off Hotel Bookings at Aer Lingus - Easter Sale Special! Aer Lingus are the proud flag carriers of Ireland, as one of the top airlines in the nation and an international travel ambassador of Eire. But at its first founding in 1936, it was called Irish Sea Airways and only provided travel from Dublin to Bristol and back with a six-seater plane. Aer Lingus enjoyed increased service to the UK and was allowed the privileges of being the only airline endorsed to ship people to and from the UK. In 1958 Aer Lingus operated its first transatlantic flight to New York, where there is a great Irish population. Fifty years on the airline offers flights to and from America, Canada and Morocco, as well as covering most of Europe. With over 3.,700 employees helping over 10.1 million people travel in and out of Ireland, Aer Lingus is an iconic contributor to Ireland’s international status and a proud representative of their treasured home nation. And offering a helping hand with hotel bookings, car rental and tourist attractions, Aer Lingus can make your trip from or to Ireland effortless, comfortable and a bargain to boot. How do I use my Aer Lingus promo code? For easy access to the lowest fares, download the Aer Lingus app. Who do I call if I left something on an Aer Lingus flight? Give customer service a ring on 0333 006 6920, or contact their support team online. I need to change my Aer Lingus Booking, how do I do this? By contacting Aer Lingus here. You can only change your booking online if you made the booking online. Please take note that your travel extras may not be transferred to your new booking. How can I check my flight details with Aer Lingus? For quickest access to your flight information, as well as travel alerts, download the Aer Lingus app. Call on 0333 006 6920 for UK enquiries, otherwise, use their support programme to get in touch. Each cancellation is specific to the flight in question, but neither saver fares or plus fares are refundable. For more information call their customer service on 0333 006 6920. A long-time favourite of the emerald isle, there’s no better way to fly to or from Ireland than Aer Lingus. With journeys all around Europe, America and North Africa, you could be on your dream holiday for less with an Aer Lingus promo code, whether it’s a ceili in County Mayo or Bolero in Barcelona, you can be enjoying the finest culture the world has to offer at an affordable price. Aer Lingus don’t only help you get to your dream destination, but they’ll help get you around as well. With Aer Lingus teaming up with six of the finest car rental companies in the world you can easily navigate your adventure getaway in comfort and style. What’s more, Aer Lingus have you covered if you have one of the notorious travel nightmares, with 24-hour customer service in case of the dreaded breakdown. From their sense of humour to their music and pubs, the Irish know how to have a good time. If you want to travel with a group to Ireland, and why wouldn’t you, you can make huge savings with group bookings, as well as your Aer Lingus discount code. This way you don’t have to confirm passenger names until 10 days before your departure, securing the lowest prices, but maintaining the flexibility you need for your a group holiday to remember.